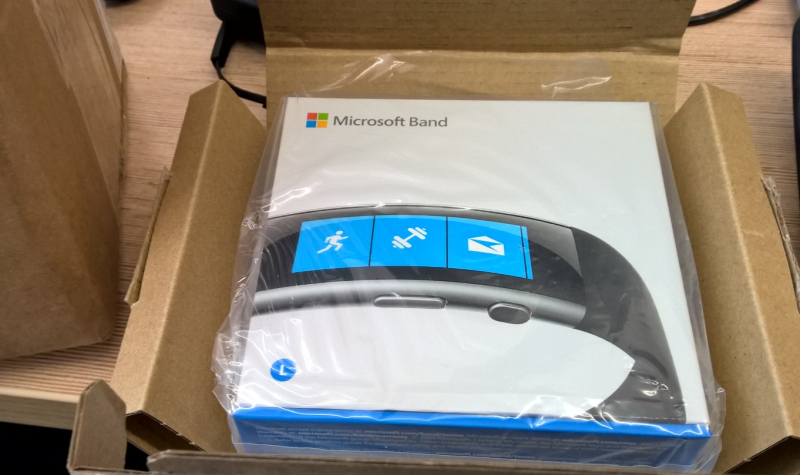 My Microsoft Band finally arrived yesterday morning, so obviously I put it straight on (after a charge of course). Here is a chronicle of first impressions. Out of the box, setup was really easy. Simply following the instructions on the band and the phone made it simple. I paired it with my Windows Phone (a Lumia 930) and as soon as the connection was made, the two devices started to chat to each other, downloading updates for the band using my phone's internet connection. Very Internet of Things. Once that was complete I played around with the apps and tiles available, configuring the ones I wanted and turning off ones I didn't (like Starbucks and Twitter). At first after putting it on it was a little uncomfortable, since I am wearing it on my right wrist and I have always worn my watch on my left. This quickly passed and I barely felt it anymore after that. I turned on txt and email alerts and started getting a buzz on my wrist every time an email or txt came in. Notifications also came through to the Band as well. Haptic alerts can be adjusted to the strength that works for you. I was able to use the on-screen keyboard to reply to txt messages, and played with some Cortana searches such as "remind me to buy milk on the way home" and "what am I doing tonight". Simple commands relay the Cortana results back to the Band. Other more complex results such as search results would direct you to look at your phone. The band does have a watch mode, but I don't think I'll use it for now. First, I still wear an analog watch on my left write, but the second is power consumption. The Always On mode means you can treat it like a regular watch when you're not interacting with it. The caveat is that it uses more power. There is a Rotate On mode as well, which will flash up the time when you flick your wrist around to look at the Band. I was finding that this was triggered more often than I wanted it to be, and was distracting, so the setting is now Off. A feature I didn't know the band had been Speed Reading. When a message is displayed, you can scroll up and down and read it yourself. If you press the Action button It will display one word at a time for you to read in a speed reading fashion. I quite enjoyed the settings available for speed: Off, Slower, Slow, Medium, Fast and Faster. My current setting is Fast. I have a Fitbit. It's the Fitbit One model, that comes with a belt clip case, and a velcro arm wrist that you can slot it into to track your sleep. That lasted about 3 weeks before it was too much hassle changing the case over every night and every morning. Last night I wore the Band to bed. Sleep mode is easy to turn on and produced some interesting results. Firstly, the alarm I set for 7 am woke me up at 6:30. This is the Smart Alarm feature, that decides the optimal time to wake you up. Sure. I guess I was kind of awake anyway? 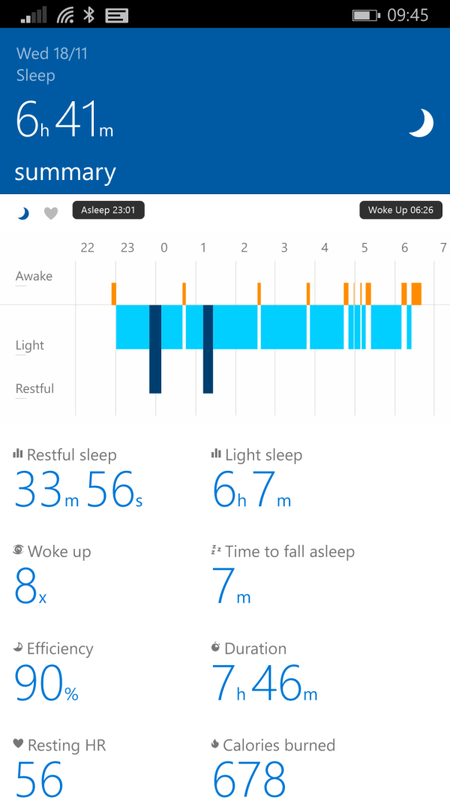 It does seem to think I had 90% efficiency in my sleep, even if I did only get 6 hours. Again, I suppose I feel rested? I do seem to wake up a lot in the night. It will be interesting to see what this looks like over time. 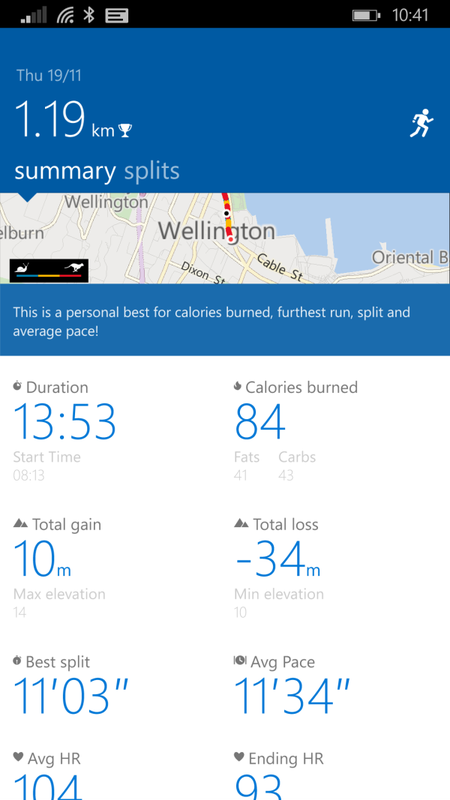 This morning I took the Run mode for a spin while walking to work. Yeah, I was only walking, but still it is interesting to see my heart rate changing, and the GPS tracking my location. I'm not sure If I gave it a full charge or not, but only just now has it given me a low battery warning. That's pretty good for a first-day use, especially while I was playing with it much more than I might on a standard day. So day 1, that's 24-26 hours of power. Time will tell if I end up averaging more or less, and how long a charge I need to give it to get that benefit back.